This is a guest post from William Porath of the Pontificia Universidad Católica de Chile. It is based on a recent paper published by William and co-authors José-Joaquín Suzuki (Pontificia Universidad Católica de Chile), Tania-Marie Ramdohr (Pontificia Universidad Católica de Chile) and Juan Cristóbal Portales (Universidad Adolfo Ibáñez) in the Bulletin of Latin American Research. The full paper is available here. Presidential power in a mediatized society is increasingly determined by the image that the leader is able to transmit through the media, as the basis of his or her popular legitimacy. This is, of course, beyond the presidency’s institutional power basis. In the Chilean case, it appears that this country has increasingly become a mediatized society. Under this assumption, we conducted a study that has just been published in the Bulletin of Latin American Research, regarding what issues or topics are most covered or highlighted by the press across three presidential campaigns in Chile, over a span of 20 years. The assumption is that those aspects that the press highlights about the campaign are an indicator as to what attributes a candidate, i.e. the future president, should have, or about what issues public debate should concentrate on. That is to say, the profile of the candidates for president being displayed to the public through the media, should be the profile and the concerns of those deemed fittest for the office, according to this indirect way of assessing public opinion. In 1989, and excluding the simple general information about the campaign and the discussion of certain issues as various controversies and political attacks, the topic that found most interest in the media was the government programs of the candidates, which occupied 35% of the analyzed space. 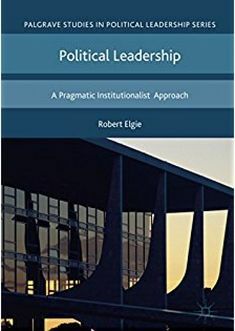 We could say then that at that time the basis of public legitimacy of a candidature was in its ability to offer solutions, through public policies, to the problems, which society felt was important and urgent. It is therefore interesting to note that 10 years later, during the presidential election of 1999, that this space decreased to 24% and continued to decline to during the 2009 campaign, when it reached 19%. In summary, proposals for public policies and programs have been losing importance as the basis of legitimacy for the presidency in a campaign. At least according to this analysis of the media. In this context, the subject that increases dramatically in importance is the discussion of campaign strategies. The space devoted to this topic goes from 24% in 1989 to 37% in 1999, and reached 44% in 2009. That is, following this line of argument, the basis of legitimacy of a presidential candidate is the ability to organize and lead a successful strategy to win an election, and paradoxically, not the substantive content of their policy proposals. And what about of the characteristics of the candidate? Our work has distinguished between personal political skills, as defined by the competence for office, their integrity or charisma, and the characteristics of their private lives as an ordinary person, such as their hobbies, family, appearance and wardrobe or information about their non-political biography. In this sense, the media interest in the political competencies of the candidates remained constant in all three elections analyzed, around 8% of campaign coverage. Meanwhile the interest in the private life of candidates (the “privatization “of politics) remained around 5% in the first two elections we studied, but it then rose explosively in 2009 to occupy about 19% of all coverage. It appears that there is a new basis of legitimacy for candidates for the post of president in Chile: his or her private life. In any case, we should point out that our analysis considers the four most important newspapers in the country, in terms of circulation and national scope, including two tabloids or so called “popular presses”. And if their presence explains the huge increased interest in the private lives of candidates by 2009, it is significant that the same pattern is repeated in the serious press, or the reference newspapers. The above analysis was also broken down according to the actor who took the initiative. Thus, we separately analyzed the agenda that was initiated by the press, and we compared it with the priorities of the issues that came to the newspapers as direct or official statements from candidates. By doing this, the impression is that politicians have tended to follow a pattern of discussion that has been imposed upon them by the media. For example, if the candidates initially showed more interest in discussing their proposals for public debate, allocating about 43% of the space in their statements in the media to this subject, in 2009, that space fell to 35%. Also, given the growing media interest in the campaign strategies of the candidates, discussion of strategies shifted from 19% of candidates’ statements in 1989, to 24% in 1999, and 33% in 2009. It is also significant that by 2009, the candidates themselves quadrupled the space allocated to details of their private lives (16% vs. 4%). Of course this year, the slowing economy, the accumulation of structural reforms undertaken by the government, and a series of political corruption scandals have returned the focus to political issues. In particular, the deep distrust that the public feels about the political system and the increasing loss of its legitimacy have returned to public debate the question of political leadership and acumen, above and beyond simple popularity in the media. This entry was posted in Latin America and tagged Chile, Media, Presidential Power, Public Opinion on November 13, 2015 by David Doyle. Nearly two weeks ago, the President of Chile, Michelle Bachelet, during an interview with Canal 13, announced somewhat unexpectedly that she had asked her entire 23 member cabinet to resign. Stating that now was “the moment to change the cabinet”, President Bachelet then said that she would consider the position of her former ministers over a 72-hour period. Those 72 hours are now up and President Bachelet has presented her new cabinet in what amounts to the most significant cabinet reshuffle ever witnessed in contemporary Chile. Five ministers have been completely removed from the cabinet, while four others have received new portfolios. Interpreted as a shift to the centre within the centre-left Concertación, Rodrigo Valdés, an economist trained at MIT, replaced Alberto Arenas as Finance Minister. This is the first time that a sitting Finance Minister has been removed by a Chilean President mid-term since Chile’s return to democracy in 1990. Jorge Burgos, formerly Defence Minister, replaced Rodrigo Peñailillo as the Minister of the Interior while Alvaro Elizalde, formerly the chief government spokesperson, was replaced by Marcelo Díaz, formerly ambassador to Argentina. In addition, President Bachelet announced new ministers for Defence, Labour, Culture and Social Development. Some key portfolios remained undisturbed: Heraldo Muñoz will continue as Foreign Minister and Nicolás Eyzaguirre, key to the President’s wide-ranging education reforms, will stay as Education Minister. The cabinet reshuffle can primarily be understood in the context of Michelle Bachelet’s dwindling popularity. Her approval ratings have reaching the nadir of the low thirties, a far cry from the eighty plus rating that she enjoyed towards the end of her first term in office. In turn, this poor support for her administration is largely a product of a number of corruption scandals that have recently engulfed the Chilean body politic, leaving the Chilean electorate generally dissatisfied and unhappy with the political elite and the institutions of the state. The first of these corruption scandals involves one of Chile’s largest corporate entities, Penta Group, which was allegedly receiving false invoices from politicians in order to allow the company channel illegal campaign donations to political parties, mainly the right-leaning Unión Demócrata Independiente (UDI). A number of Penta executives were jailed, but have since been released and placed under house arrest. More significantly however, one of the scandals involves the President’s own son, Sebastián Dávalos. Dávalos has been accused of using his political influence to arrange a US$10 million bank loan for his wife’s firm, Caval, which then used the funds to purchase land in central Chile that was promptly resold for a profit. Although the national banking regulator has cleared Dávalos of any wrongdoing, Congress has launched an investigative committee to explore the allegations. For a previously enormously popular president, who was partly elected due to her harsh critique of staid and corrupt practices among the country’s political elite, these scandals have been disastrous for her administration. President Bachelet denies any wrongdoing, or knowledge of the loan her son received, but the scandals have nonetheless left their mark. The cabinet reshuffle is clearly an attempt to inject new life and untarnished political blood into her damaged administration. We will just have to wait and see if it works. This entry was posted in Latin America and tagged cabinet reshuffle, Chile, Michelle Bach on May 19, 2015 by David Doyle.